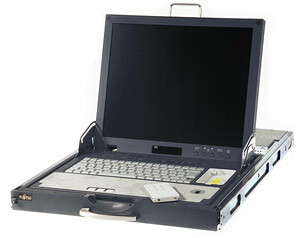 Fujitsu SERVIS FD-5100 Series - High resolution TFT LCD, Lift-up keyboard and optical mouse for simple local operation. Fujitsu's latest addition to its Console Drawer range (FD-5100MT) further improves operability and visibility in the server room rack environment with a newly developed industry first 17-inch TFT LCD Lift-up drawer. A flat operation surface is provided by a lift-up mechanism, allowing the keyboard/mouse operation area to rise automatically in co-ordination when the monitor is raised. A new concept optical reflection mouse (slim card type) is incorporated as standard and delivers operability comparable to that of conventional optical mice. Multi-Platform support for PS/2, USB and Sun.